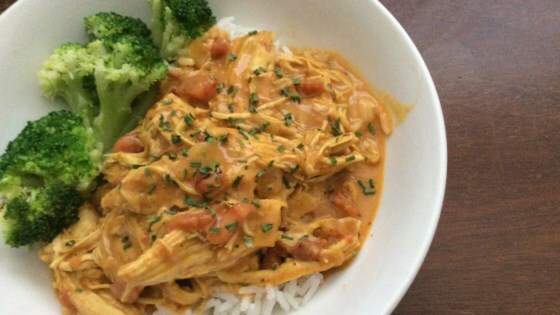 "This is a rich, creamy coconut-curry dish that comes together quickly in an Instant Pot®. Customize the taste by using more or less curry powder and sugar. Delicious over jasmine or basmati rice! Garnish with chopped chives, if desired." Turn on a multi-functional pressure cooker (such as Instant Pot(R)) and select Saute function. Add coconut oil; when hot, add onion and cook for 1 minute. Add 2 tablespoons curry powder and garlic. Mix well and cook for 2 minutes. Turn off Saute function. Stir in diced tomatoes, tomato sauce, chicken broth, and sugar. Poke holes into each chicken breast using a fork. Sprinkle with salt, pepper, and remaining curry powder. Add seasoned chicken to the pot. Close and lock the lid. Select high pressure according to manufacturer's instructions; set timer for 10 minutes. Allow 10 to 15 minutes for pressure to build. Release pressure using the natural-release method according to manufacturer's instructions for 10 minutes. Release remaining pressure carefully using the quick-release method according to manufacturer's instructions, about 5 minutes. Unlock and remove the lid. Remove chicken; use 2 forks to shred the meat and return it to the pot. Turn on Saute function; cook and stir until liquid is lightly boiling, 2 to 3 minutes. Turn pressure cooker to Keep Warm. Add coconut milk and stir well; cook for 10 minutes more to allow flavors to come together. See how to make quick-and-easy curried chicken. I used a can of tomato paste instead of tomato sauce to hopefully make it a little thicker. It turned out wonderful and will be made many more times.